We determined the effect of andrographolide and one of its novel semi-synthetic analog, DRF 3188, on the cell cycle of MCF 7 breast cancer cells. The effect of the compounds on cell cycle was determined using FACS and western blot analysis of cell cycle proteins. Hollow fibre assay was used to determine if the compounds had the same effect on the cell cycle in vitro and in vivo. Our results from the in vitro and in vivo experiments show that both the compounds block the cell cycle at the G0-G1 phase through the induction of the cell cycle inhibitor, p27, and the concomitant decrease in the levels of Cdk4. The results show that the novel semi-synthetic analog, DRF3188, and andrographolide bring about the anti cancer activity by a similar mechanism. Cell cycle can be defined as an ordered set of events culminating in cell growth and division into two identical daughter cells. In normal cells this complex process is initiated only in the presence of a mitogenic stimulus. Various proteins like the cyclin dependent kinases; cyclins and cyclin dependent kinase inhibitors regulate this event . However, in cancer cells this regulation of the cell cycle is lost and the cells continue to divide irrespective of the presence or absence of a mitogenic stimulus . This observation has led to deciphering the mechanism of action of many of the known anti-cancer agents, currently in clinical use. These agents were shown to block the cell cycle at different stages. Examples include, Methotrexate (blocks at the S-phase), Doxurubicin (blocks at the G2 phase), Topotecan (blocks at the S and G2 phase) etc. Intense research efforts are now on for identifying cell cycle specific inhibitors for the treatment of cancer (Ex: Flavopiridol). Andrographolides, obtained from the herb Andrographis paniculata, are known to have several medicinal properties including anti-cancer activity [3–6]. Using andrographolide (Fig. 1) as a template a library of analogs were synthesized and analysed for anti-cancer activity. One of the semi-synthetic analogs, DRF 3188 (Fig. 1),  was shown to have a better anti-cancer activity compared to the parent compound (extracted from the whole plant) . We wanted to determine the effect of andrographolide and its semi-synthetic analog on the cell cycle. In this paper we show that andrographolide and DRF 3188 block the cell cycle at the G0-G1 phase, both in vitro and in vivo. This shows that the semi-synthetic analog and the parent molecule have a similar mechanism of anticancer activity. Lovastatin, Andrographolide and the semi-synthetic analog (DRF 3188) were synthesized by the Discovery Research Group (synthesis and SAR of Andrographolide and DRF3188- reference  and ). The drugs were dissolved in DMSO at 10-2 M concentration and then further diluted to the required concentration in the appropriate assay medium. MCF7, breast cancer cell lines were obtained from ATCC, USA. Cells were grown in RPMI-1640 media (Sigma, U.S.) containing 10% FBS, 100 mg/L Streptomycin and 105 units Penicillin. A humified incubator with 5% CO2 was used to grow the cells at 37°C. The fibres containing cells were transferred into 6 well plates containing RPMI-1640 with 20% FBS and incubated for 30 m at 37°C in a 5% CO2 incubator. 1 ml of 0.1% MTT (Sigma M2128) solution was added and incubated at 37°C for 4 h in a 5% CO2 incubator. The MTT solution was aspirated out and the fibres were washed with 2 ml of 2.5% Protamine sulfate (Sigma P4380). A second wash was done using 1 ml 2.5% Protamine sulfate. The fibres were air dried for 2–3 h. 250 μl of DMSO was added, 150 μl of each sample was transferred to a 96 well plate and read at 570 nm. The percentage net growth of the cells was calculated using the formula (T-To/To) × 100 where T is the O.D. 570 nm of the cells in the fibres at the end of the experiment and T0 is the O.D. 570 nm of the cells at the time of loading cells into the fibre. MCF 7 breast cancer cells were treated with 5 μM andrographolide or DRF 3188 for 24 and 48 h. The cells were trypsinized, washed with PBS and fixed in 80% ethanol overnight at 4°C. Fixed cells were washed with PBS and 2 × 106 cells/ml were resuspended in PBS. Cells were incubated for 10 m at 37°C with 10 μg/ml RNase and then for a further 10 m at 4°C. Cells were stained with 500 μg/ml propidium iodide. The samples were run on a FACS and analysed for DNA ploidy. The analysis was done using the "cell quest" soft ware from Becton Dickinson. Cells were plated and incubated at 37°C for 24 h. 25 μM andrographolide, 25 μM Lovastatin or 5 μM DRF 3188 were added. For all experiments cells were treated with the above mentioned concentrations of the compounds for 24 h. Lysis buffer (10 mM Tris-Cl pH7.2, 150 mM Sodium chloride, 1% triton X-100, 0.1 mM Sodium orthovanadate, 1 mM PMSF, 10 ug/ml Aprotinin, 10 ug/ml Leupeptin) was added to the cell pellet and stored on ice for 30 m with intermittent vortexing. The cell lysate was centrifuged to remove the unlysed cells. To the supernatant 3x Laemmli buffer (100 mM Tris pH 6.8, 6% SDS, 0.3% bromophenol blue, 30% glycerol and 3% β-Mercaptoethanol) was added to get a final concentration of 1x. The samples were boiled at 95°C for 5 mins and the proteins were separated by SDS PAGE. Proteins were transferred onto a nitrocellulose membrane by the semi-dry method. Western blot analysis was done using p27 (sc-776), CDK 4 (sc-749), CDK 1 (sc-747), Cyclin B1 (sc-752), antibodies form Santa Cruz Biotechnology Inc.; Cyclin D1 (Pharmingen, cat.# 556470) and Actin (Oncogene research cat.# cpo1). The blots were developed using the ECL kit from Amersham. The in vivo activity of andrographolide and DRF 3188 was determined using the modified hollow fibre assay method . Hollow fibres (from Spectrum laboratories, USA) were rehydrated, flushed with 70% ethanol, washed and sterilized. The fibres were loaded with 105 cells/ml, of MCF 7, in RPMI-1640 with 20% FBS. Fibre capsules of 2 cms in length were prepared by heat sealing and incubated overnight at 37°C in a humified incubator with 5% CO2. The fibres were implanted into two compartments, the peritoneum (IP) and subcutaneous (SC) sites of Swiss Albino Mice (SAM). Two days after implantation the drugs were administered intra-peritoneally at a low and high dose (determined by the Maximum Tolerated Dose (MTD) experiment). The compound was administered once a day for 4 days. A day after the drug treatment period, the animals were sacrificed by cervical dislocation and the fibres were collected in RPMI-1640 with 20% FBS. Cells from one fibre, from each animal, were used for MTT assay. Cells from the remaining fibres were used for preparing the lysate. The proteins were separated by SDS-PAGE and the western blot was done using p27 and CDK 4 antibody. Equal protein loading in each lane was determined using the actin antibody. To determine if andrographolide and its semi-synthetic analog show a similar effect on the cell cycle, we used fluorescence activated cell sorting (FACS). Cells were treated with the compounds for 24 or 48 h and the block in the cell cycle was determined. The percentage increase or decrease in the number of cells in each phase of the cell cycle compared to that in the control was determined and represented as a bar graph. On treatment with 10 μM Lovastatin for 24 h there was a 25% increase in the number of MCF 7 cells in the G0-G1 phase (Figure 2A) while there was a 52% and 42.3% decrease in the number of cells entering the G2-M and S phase of the cell cycle, respectively. This indicated that the Lovastatin treated cells were arrested in the G0-G1 phase of the cell cycle. FACS analysis of MCF 7 cells treated with Butyrolactone for 24 h showed a 7.5% increase in the number of cells in the G2-M phase and a decrease in the number of cells in the G0-G1 and S phase of the cell cycle, when compared to the control cells, indicating a G2-M phase arrest. On treatment with andrographolide or DRF 3188, for 24 h, an increase in the number of cells in the G0-G1 phase (15–20%) and a significant decrease in the number of cells entering the S and G2-M phase was observed (about 30% less cells in the S phase and approximately 50–60% decrease in the G2-M phase) compared to the control cells. This indicated that andrographolide and DRF 3188 treated MCF 7 cells were blocked in the G0-G1 phase of the cell cycle. Mechanism of anti-cancer activity of andrographolide and DRF 3188 – In vitro studies: Cell cycle analysis A. Fluorescence associated cell sorting analysis of MCF 7 cells treated with andrographolide (5 μM) or DRF 3188 (5 μM) for a period of 24 hours. Lovastatin (10 μM) and Butyrolactone (10 μM) were used as positive controls. Andrographolide and DRF 3188 exhibit a G0-G1 arrest like Lovastatin. Butyrolactone treated MCF 7 cells exhibit a G2-M arrest. B. After a 48 h treatment with Andrographolide or DRF 3188 MCF7 cells exhibit a G0-G1 arrest, similar to Lovastatin. Butyrolactone treated cells exhibit a G2-M arrest. When the treatment period was increased to 48 h a similar profile was seen (Figure 2B). Andrographolide and DRF 3188 caused a G0-G1 phase cell cycle arrest as was seen in the Lovastatin treated cells. However, a better cell cycle arrest was seen with a 24 h drug treatment. After a 48 hour treatment with andrographolide or DRF 3188 an increased population of the cells were found in the sub G1 phase of the cell cycle (data not shown). This indicated that after a prolonged exposure, to the compounds, the cells were dying. Hence for the remaining experiments the cells were treated with the compounds for 24 h.
FACS experiments showed that the andrographolide and its semi-synthetic analog block the cell cycle at the G0-G1 phase. To confirm this result we analysed the levels of cell cycle regulatory proteins in the andrographolide and DRF 3188 treated MCF 7 cells by western blot analysis. Cells were treated with 25 μM Lovastatin or 25 μM andrographolide or 5 μM DRF 3188 for 24 h. The cell lysates were analysed for levels of p27, Cdk 4, Cyclin D1, Cdk 1 (Cdc2p34), Cyclin B1. Equal protein loading was shown using actin antibody. 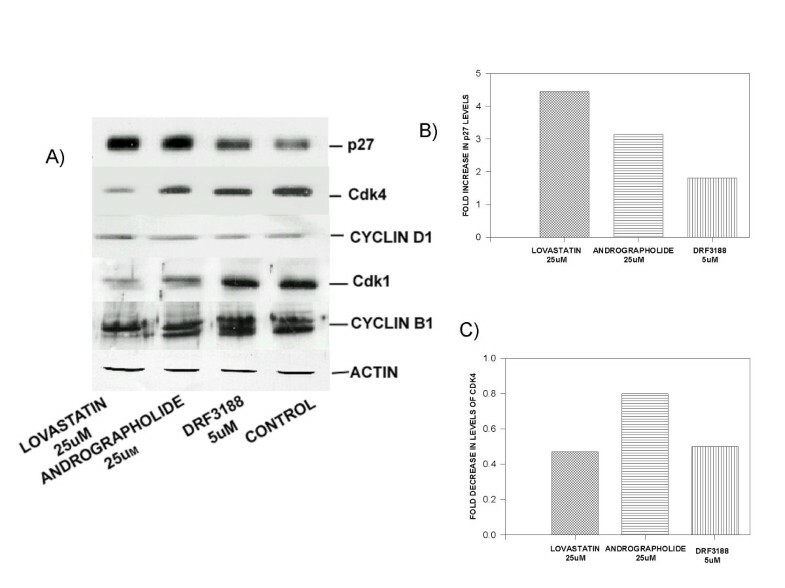 Western blot analysis of the Lovastatin, andrographolide or DRF 3188 treated MCF 7 cells (Figure 3A) showed an increase in the level of the cell cycle inhibitor p27 when compared to the levels in the control (3B). The levels of Cdk4 decreased after treatment with the compounds (Fig. 3A,3C). Andrographolide or DRF 3188 treated MCF 7 cells did not show any significant change in the levels of Cyclin D1 or Cyclin B1. However, on treatment with Lovastatin a decrease in Cyclin B1 levels was observed. The levels of Cdk 1 (p34Cdc2) in the control and DRF 3188 treated cells were similar while a decrease was seen after treatment with andrographolide. Lovastatin treated cells showed a significantly reduced level of Cdk1 when compared to the control cells. Western blot analysis with actin antibody showed that similar concentration of protein was loaded in each lane. The induction of p27 and decrease in the Cdk4 levels indicate a G0-G1 arrest of the cell cycle corroborating the FACS data. Mechanism of anti-cancer activity of andrographolide and DRF 3188 – In vitro studies: Western blot analysis of cell cycle proteins A. Western blot analysis of cells treated with Andrographolide (25 μM) or DRF 3188 (5 μM) for 24 hours. An induction of the cell cycle inhibitor p27 and reduction in the levels of Cdk4 is observed. No change is observed in the levels of Cyclin D1, Cdk1 or Cyclin B1 in DRF 3188 treated cells. A similar effect is seen in the andrographolide treated cells, but a slight decrease in the level of Cdk 1 is observed. Lovastatin treated cells show decreased levels of Cdk1 and cyclin B1. Actin is used as the internal loading control. B) Densitometric analysis of the western blot with p27 antibody. An induction of p27 is seen in MCF7 cells treated with 25 uM Lovastatin (4.5 fold), 25 uM Andrographolide (3 fold) and 5 uM DRF3188 (2 fold). C) Densitometric analysis of the western blot with Cdk4 antibody. A decrease in the levels of Cdk4 is seen when MCF7 cells are treated with 25 uM Lovastatin (0.4 fold), 25 uM Andrographolide (0.8 fold) and 5 uM DRF3188 (0.4 fold). Hollow fibre assay system was used to determine the effect of andrographolide and DRF 3188 on MCF 7 cells, in vivo. MTT assay was done to determine the cell viability after treatment with the low and high dose of andrographolide and it's analog. As shown in the figure 4A, andrographolide at a concentration of 50 mg/kg body weight did not have any effect on the cancer cells, irrespective of the site where the fibres were implanted. At the higher concentration of 100 mg/kg body weight, growth of about 50% of the cells (fibres placed in the peritoneum or subcutaneous layer) was arrested. The proliferation of about 75% of the cells placed in the peritoneum or subcutaneous region was affected when treated with the low or high dose of DRF 3188. 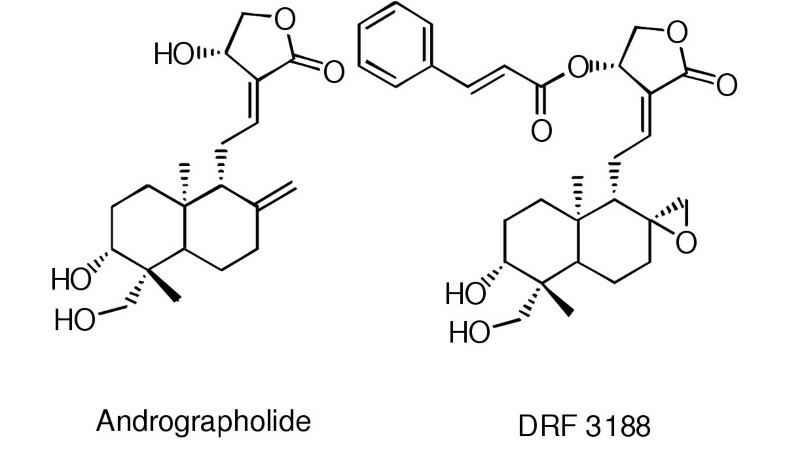 Mechanism of anti-cancer activity of andrographolide and DRF 3188 – In vivo studies. A. MTT assay of the cells placed in the hollow fibres and implanted either in the peritoneum (IP) or sub-cutaneous (SC) region of Swiss Albino Mice (SAM). Andrographolide does not have any effect on the cells at the lower dose of 50 mg/kg. However, a 50% cell kill is seen at the higher dose of 100 mg/kg. DRF 3188 treatment results in the death of 75% of cells after treatment with low or high dose of the compound. This effect is observed irrespective of whether the cells are present in the peritoneum or subcutaneous region. B. Western Blot analysis of the MCF 7 cells placed in the hollow fibre, after treatment for four days. At the low dose of 50 mg/kg andrographolide has no effect on the cells placed in the peritoneum or subcutaneous layer. At the high dose of 100 mg/kg of andrographolide an induction of p27 is seen. Similarly treatment with low or high dose of the semi synthetic analog DRF 3188 leads to an induction of p27. Under similar conditions cells placed in the peritoneum exhibit a reduction in the levels of Cdk 4. However, the cells placed in the subcutaneous region do not exhibit this effect. The western blot with Actin was done as the internal loading control. Further, to determine if the in vivo anti-proliferative effect of andrographolide and DRF 3188 was due to a G0-G1 cell cycle arrest, as was seen in the in vitro experiments, MCF 7 cells placed in the hollow fibres were analysed by western blot to determine the levels of cell cycle proteins. Western blot analysis (Figure 4B) showed that the andrographolide (50 mg/kg) treated cells, present in the peritoneum (left panel) or subcutaneous region (right panel), and the untreated control cells had similar quantities of the cell cycle inhibitor p27 and the cyclin dependent kinase, Cdk 4. However andrographolide treatment, at 100 mg/kg body weight, resulted in an induction of p27 in the cells placed at both the sites. A decrease in the levels of Cdk4 was seen only in the cells placed in the peritoneum and not in the subcutaneous region. DRF 3188 at a high and low dose caused an induction of p27 in the MCF 7 cells placed in the peritoneum (left panel). An increase in p27 levels was seen in the MCF 7 cells placed in the subcutaneous region (right panel) when treated with 25 mg/kg body weight DRF3188. However at the higher dose of 50 mg/kg DRF3188 no such increase could be detected because of the decreased protein loading as shown by the western blot with actin. At both the low (25 mg/kg) and high dose (50 mg/kg) a decrease in the Cdk4 levels was seen only in the cells placed in the peritoneum (left panel) and not in the subcutaneous region (right panel). A decrease in Cdk 4 seen when MCF 7 cells (subcutaneous) were treated with 50 mg/kg DRF 3188 was due to a loading error as was shown by the western blot with actin antibody. Actin was used as the internal loading control. This result clearly showed that the andrographolide and DRF 3188 treatment exerted a similar effect on the cell cycle, both in vitro and in vivo. Andrographolide and its semi-synthetic analog, DRF 3188, are both known to have an anti-cancer and immunomodulatory activity [10, 11]. 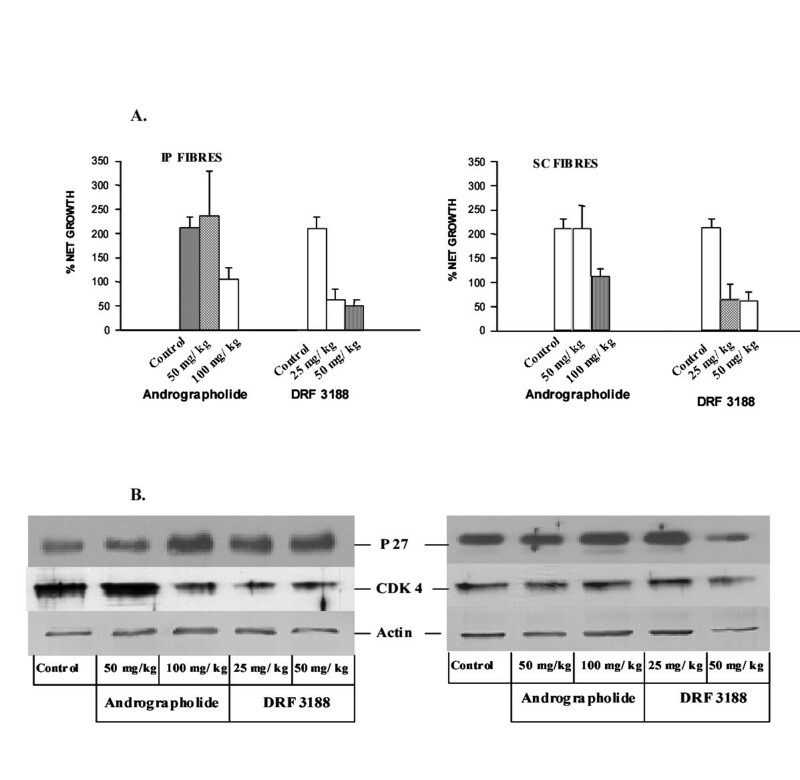 In this paper we show that Andrographolide and DRF 3188 bring about the anti-cancer activity by blocking the cell cycle at the G0-G1 phase. This effect of the compounds on the cell cycle is similar both in vitro and in vivo. Previously, Parceslain Incorporated had reported that Andrographolides have an anti-cancer activity brought about by reducing the levels and activity of Cdk 1, thus indicating a G2-M arrest . However, their FACS data showed an increase in the number of cells in the G0-G1 phase and decrease in the number of cells in the G2-M phase, indicating a G0-G1 arrest of the cell cycle. Since their FACS and biochemical data were not corroborating we wanted to determine the exact effect of Andrographolide on the cell cycle. FACS analysis was performed using the MCF 7 cells treated with Andrographolide or its analog. Treatment with either the parent compound or the analog clearly showed that the cell cycle was arrested at the G0-G1 phase. In order to confirm this observation we checked the levels of cell cycle proteins. It is known that specific cyclins and cyclin dependent kinases are activated at each stage of the cell cycle, and are degraded once their function is completed . Cell cycle inhibitors, p21, p27, p57 etc are also known to regulate the cell cycle . Western blot analysis of the cells treated with andrographolide or its analog showed an induction of the cell cycle inhibitor p27. p27 is known to prevent the entry of the cells into the 'synthetic phase' (S phase) from the G0-G1 phase . p27 binds to the Cdk4-cyclin D1 complex preventing phosphorylation of the retinoblastoma (Rb) protein and release of the elongation factor E2F. This prevents the transcription of many of the proteins required for the cell to transit the 'S' phase. Interestingly, treatment with andrographolide or DRF 3188 resulted in a decrease in the level of Cdk 4 but there was no significant change in the levels of Cyclin D1. No significant change in the level of Cdk1 was seen and the kinase activity was also not affected (data not shown), indicating that the cells were not blocked in the G2-M phase as reported previously . 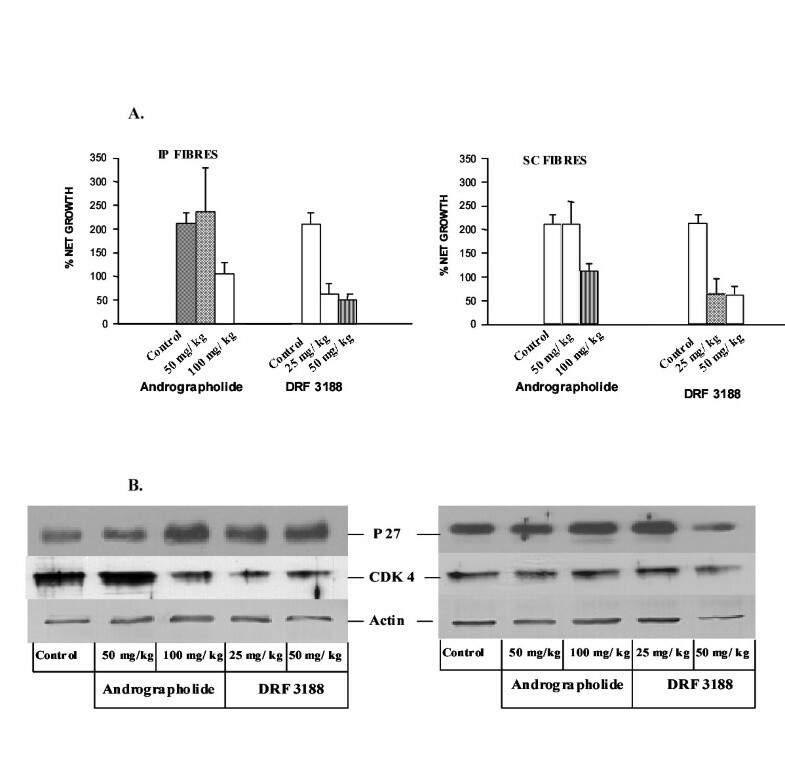 The cellular effect of andrographolide and DRF 3188 on cancer cells is indicated by induction of p27 and decrease in the levels of Cdk4 resulting in G0-G1 cell cycle arrest. Next we wanted to address whether this cellular effect on cancer cells would be similar when compounds are given in vivo in an animal model. Hollow fibre assay offers a unique opportunity, depending on the route of administration, to study both the direct cellular effect of the compound and the indirect effect after systemic circulation of the compound . Also the in vivo effect of the compound can be determined on a pure population of cancer cells that is not possible in the xenograft model where the surrounding normal cells can have a contaminating effect . 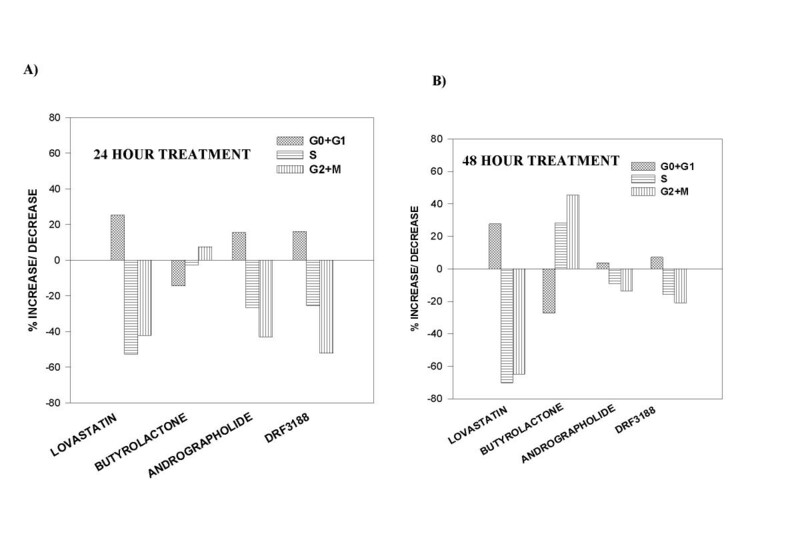 The hollow fibre assay showed that both andrographolide and DRF 3188 have an anti-proliferative effect on the cells placed in the peritoneum (direct effect) and subcutaneous region (distant site). Western blot analysis of these cells showed an induction in the levels of p27 indicating a G0-G1 arrest of the cell cycle, as was seen in the in vitro experiments (FACS analysis could not be done due to the fewer number of cells used in the hollow fibre assay). This result demonstrated that andrographolide and its novel semi-synthetic analog have a similar effect on the cell cycle both in vitro and in vivo. Andrographolide and DRF 3188 block the cell cycle at the G0-G1 phase. The simultaneous induction of p27 and decrease in Cdk 4 suggests that the p27 might be binding and inactivating the Cdk4 leading to its degradation. However, one would expect a degradation of the corresponding cyclin, Cyclin D1 too. However, we see no change in the level of this protein. The decrease in the level of Cdk4 in the presence of the compounds could be due to a decrease in transcription of the CDK4 gene. However, we do not know if the effect on the levels of p27 and Cdk4 seen in the andrographolide treated and DRF 3188 treated cells are interdependent or are occurring independent of each other. To understand the mechanism better we are currently trying to determine the exact molecular target of andrographolide that leads to a block in the G0-G1 phase of the cell cycle, bringing about the anti-cancer activity. We would like to thank Mr. T. Sravan Kumar Reddy for his technical support in conducting the Hollow fibre assay. We thank Dr. A. Venkateshwarulu for his continued support and encouragement of this project.